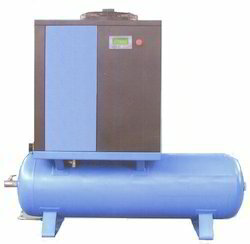 Leading Manufacturer of rotary air compressors from Ahmedabad. With the experience of past several years of successful services in this line of work, we have brought forth to our clients one of the finest quality rotary air compressors. These rotary air compressors are generally used for the purpose of compressing the air to desirable pressure levels by the process of rotation provided by motor or generator. These rotary air compressors have been manufactured at our company using top grade raw materials which are very tough, tensile and rigid in nature. We are offering these rotary air compressors to our clients at very conveniently affordable range of prices.